Ngong town in the Ngong Hills is a bustling town about an hour south west of Nairobi. Whatever you need you can buy it in Nygong town. This community is a place where crossing the main street with cars and motorcycles and trucks and buses and vans traveling every which way–you better be fast. There are numerous services here, beginning with Barclay Bank. There are also eateries, grocery stores, hardware stores, meat markets, schools, roadside vendors, garment makers (think Grace—in my previous post), cell phone charging shops and internet cafes. For this post, you’ll learn all about one of these internet cafes: Osotura Café, founded and owned by Sarah Senewa. Sarah, one of 5 siblings is fortunate enough to graduate from high school and continue her education at Maasai Technical Institute, studying Secretarial and Computer Studies. She is currently married to John Parsitau. John is the coordinator for SIMOO’s education Program. He is involved in enrollments and sponsorship of Maasai students supported by MCEP donors. While doing an internship for her secretarial course, she meets John. It’s becoming more common for Maasai young women to meet their future husbands outside of arranged marriages. When John and Sarah decide to marry, a meeting is arranged where John’s father and uncles visit Sarah’s family. Their homes are hundreds of miles from each other. In 2010 when Sarah is 29 years old, she travels to Bucks County for her first and only visit. John will stay at home to look after their three sons—Brian Lenaiyia, and twins Collins Teeka and Frankline Parsitau. The experience and confidence she gains from speaking at MCEP presentations opens a window that will lead her to exploit the knowledge she learned from her computer training. 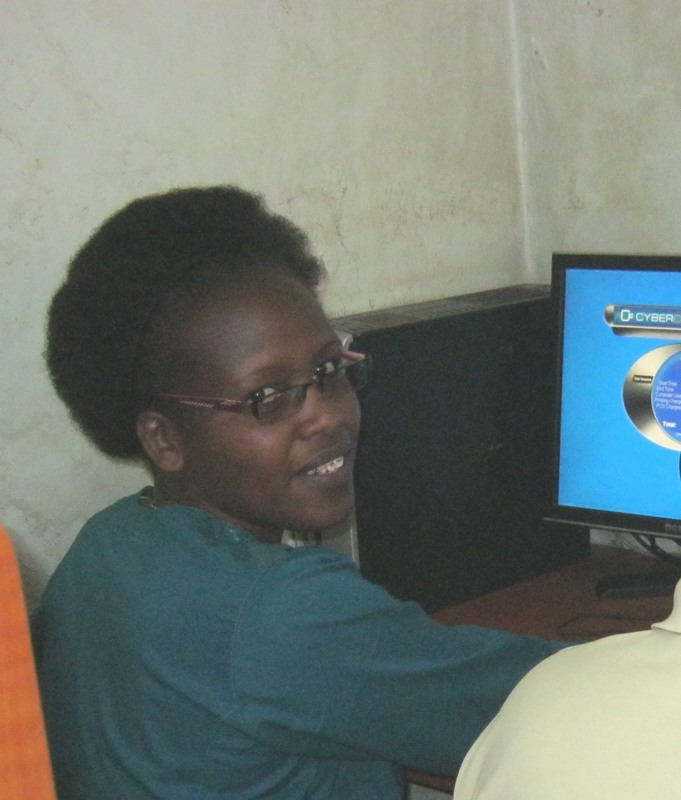 In 2012 she decides to open a computer café in Ngong town. Finding space in Ngong is a challenge because of its competitive proximity to Nairobi. Using sales from her bead work commissions, she’s able to pay the rent deposit, buy furniture and materials to partition the cyber café. John also gives her financial support by selling some of his livestock so she’s able to purchase computers, a photo copy machine, a printer and the application for an internet connection. In June 2015, she will graduate with a Diploma in Information Technology. When Sarah is not at school she works in the café where she employs one full time and one part time employee. Her future goals are to expand the inventory with stationery and offer computer equipment, repairs and maintenance. Saturday was our first full day in Kenya. We’ve just finished lunch; stopping in an internet cafe that is owned by Sarah Senewa, one of our Maasai friends. This is one example of how the women are creating their own destiny. I’m sorry for not adding a picture; just wanted to let all of you know that we arrived safely after an 18 hour flight in the air. Already I’m making notes on future posts which won’t be on The Bucks Underground Railroad until I return next week. By the way, if you’re ever in Ngong Hills, and need to email home, go to the Osotua Cafe. Since then, we attended a Maasai church service on Sunday. We showed QUENCH to the congregation. Many young people there were too young to even know or understand the challenge of walking up to seven miles for water. Today we visited Member of Parliament Moses ole Sakuda, a Maasai who is doing wonderful things for the Maasai community. We gifted him with two Obama T-shirts and absolutely loves them. The weather is like summer. We don’t miss the cold at all; everybody asks us how cold it is back home. Have taken over a hundred digi pics and am on my third roll of film. I filmed the church service (it was 4 hrs long). Exceptional. Probably won’t have an opportunity to post again. No wi-fi at the village. Tomorrow we visit the schools and wells; On Wednesday the beaders will gather at Susan’s home (she is the wife of Francis ole Sakuda, Exec Director of SIMOO). We’ll be buying stuff!